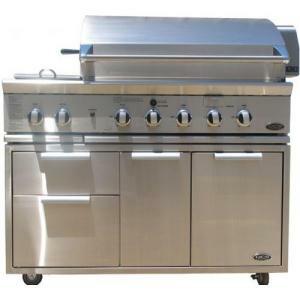 Handcrafted from 304 gauge stainless steel, the DCS cabinet-style, 48-inch gas grill features a patented grease collection system built into the reversible cooking grid. One side has rounded grill bars, better for cooking fish or vegetables, and the other side the standard V-shaped bars preferred for searing poultry and meat. Each surface includes channels that funnel waste oils towards the grease collection reservoir below the grid. A smoker tray with its own 3500 BTU burner is standard equipment and essential if you want that real woodsmoke flavor. The primary cooking surface is a spacious 638 square inches with 241 more on the warming rack. Underneath, three 25000 BTU burners provide even, radiant heat. Dual side burners of 17K BTU's apiece give you plenty of options for sauces outside the main grill area. The integrated rotissierie has its own burner, running at 14000 BTU's. Other perks include electronic ignition powered by a nine-volt battery and halogen lighting installed on the rotissierie motor. Aimed so that it illuminates the entire working surface, the lighting system is outside the main cooking area and stays free of grease and smoke. Designed to be weather resistant, the DCS uses welded seams (rather than mechanical assembly systems) for fewer gaps where water can enter or grease can collect.